Facts about White Oak Tree, "Scientific name of White Oak Tree is Quercus alba". The White Oak is a slow-growing tree which has high life expectancy and can mature to a massive tree with a broader top and wide striking branching. The White Oak Tree can grow up to several hundred years, approximately over four hundred and fifty years, before it ages. The White Oak Tree is a hard wood tree which is native to eastern North America including areas of eastern Minnesota, eastern Texas, southern Quebec and Florida. The White Oak Tree can naturally grow up to a height of about 75 to 85 feet (22.86 to 25.90 meters) tall becoming massive with it lower branching extending far out laterally approximately 50 to 80 feet (15.24 to 24.38 meters) with a trunk of about 6 feet (1.82 meters) wide. The White Oak Tree usually has a variety of bark colors including dark-gray, light gray and white with shallow ridges and overlapping scales. Its leaves are 5 to 9 inches (12.7 to 22.8 cm) long with a spread of 3 to 5 inches (7.6 to 12.7cm). They appear in an alternate arrangement and oblong in shape with seven to nine rounded lobes and sinuses of the same shape. They usually arise from their buds with a bright red color on the upper surface and pale yellow underneath, fading to a shiny silvery greenish-white color as they mature. At maturity, their colors changes to yellowish-green above with a smooth, pale color below. The leaves can turn brown or dark-red in fall during autumn. However some can remain on the White Oak Tree through winter into early spring. White Oak Tree roots usually grow two to three times the width of the tree branches. 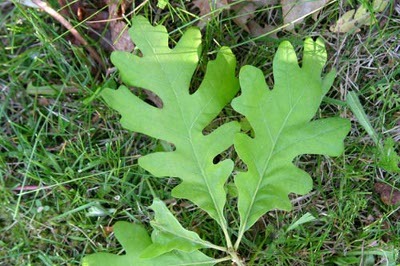 The ideal time to fertilize your White Oak Tree is in late fall or early spring. If you want to transplant a White Oak Tree do it in fall, this is ideal for most trees. White Oak Tree leaves are made up of many colored pigments, green chlorophyll hides the colors during the growing season of spring and summer. As days get Shorter and cooler temperatures come in the fall, it cause the chlorophyll to break down and than the other color pigments can be seen. White Oak Tree growth is referred to as Meristem (The undifferentiated embryonic plant tissue from which new cells are created, as that at the tip of a root or stem). This tissue can be found at the tips of shoots and leaves. Inside the stem growth in thickness occurs at the vascular cambium. White Oak Trees make their own food from sunlight, carbon dioxide, water, and nutrients from the soil. The White Oak’s flowers develop in the month of May. The flowers are characterized with bright yellow calyxes, hairy aments, yellow anthers, and bright red stigmas. The flowers are pollinated to produce sessile, light brown fruits known as acorns which can be at most 1 inch (2.5 cm) in length with a one –fourth, cup-shaped wrapping. The acorns mature to fall in late October. A Full grown White Oak Tree can absorb as much as 48 pounds (21.77 kg) of carbon dioxide a year. The same White Oak Tree could also produce enough oxygen in a day for two people. In a single day, a large White Oak Tree can drink up to 100 gallons (378.5 liter) of water from the ground and discharge it into the air. You can tell a White Oak Trees age by the number of growth rings. Growth rings size shows what kind of conditions accrued that year, the temperature and if it was a dry or wet year. The White Oak Tree can do great in USDA zone of eight. It requires moist to well drained soils. It is tolerant to cold weather conditions. The white oak tree is used for oak aging of wine due to its strong flavors. Its acorns are valuable food for the wild including rabbits, squirrels, wood peckers and deer. Bark of the White Oak Tree protects it from the elements and is made up of dead cells.